Wednesdays are my CSA pickup date. Since we moved further away from the pickup location, this now means an hour’s drive each way to the farm to get our veggies. I don’t mind, though – in addition to knowing I’m supporting a great guy and his family, and getting homegrown, organic produce, it’s a really nice drive down there. Most of the drive down takes me through Shield country, and since moving off the Shield the Wednesday drive is really the only time I get to see it unless I make a special trip somewhere. 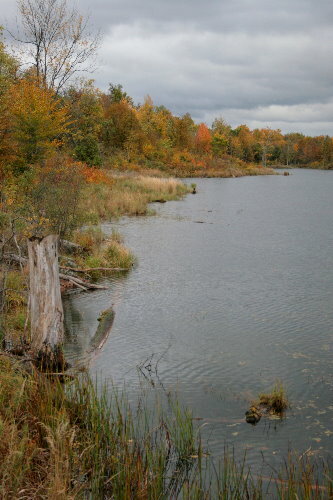 The Shield has beautiful scenery, lots of water and forest, and all of it is nearing the peak of fall colours right now. On the drive down yesterday I spent the entire time admiring the reds and oranges and bright golds. 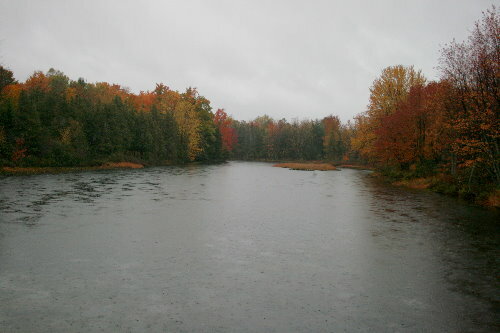 It was overcast, rainy in spots, but the dull sky only seemed to strengthen the colour of the trees. I had taken my camera with me primarily to get a photo of the Tay River when I crossed it (above; it was raining so the colours are more muted), but on the way back I stopped several times at the side of the road and dashed out with my camera to snap a photo. Fortunately, the road for the northern half of the trip is one that’s not very busy, so I could “slam on the brakes” whenever I spotted a patch of great colour. Many of them happened to be associated with water, partially because you get the best vistas with the open space, and partially because for whatever reason trees at the water’s edge often turn brighter colours than those away from it. The little boathouse in the top photo is one that I look for every time I go by. I just love the scene it forms, with the river winding through the trees and this little tumbledown shack set at its edge. The small footbridge in the above photo is another scene I admire as I drive by each trip. 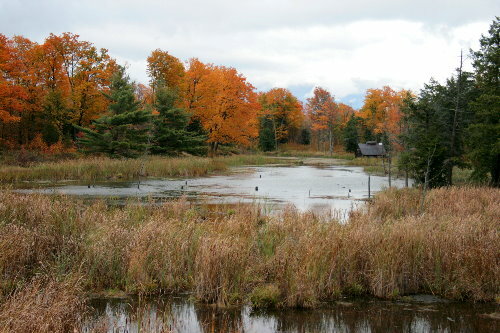 Although the transition to autumn colours isn’t unique to northeastern North America, this is the part of the world most renowned for it. 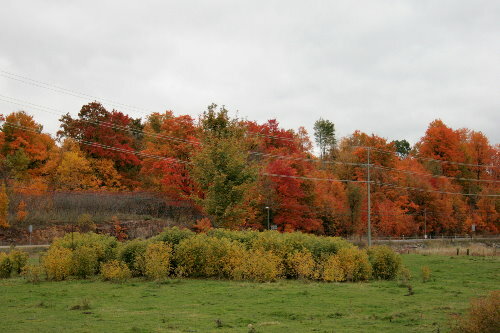 The activity of driving around to admire the fall foliage has been called “leaf peeping”, and has become a major contributor to the local economies in much of New England. For example, some four million people might visit the region during leaf-peeping season, contributing as much as $8 billion to the area’s economy – in some states, even out-earning skiing. There are many businesses, such as bed-and-breakfasts, that count on the influx of fall tourists to give their revenue a boost. When I was searching online for some figures on visitor numbers, most of the hits returned back to me were news articles dating to 2002. That year New England suffered a bad drought during the summer. The lack of water stressed out the trees and caused them to start shutting down for the winter early, about two weeks ahead of their usual schedule. Additionally, the bright colours just weren’t present – instead of reds and golds, there were dull yellows and browns. I wrote about the process that causes leaves to change colour in a post last year. You can learn more of the details by going there, but the short of it is that the trees stop renewing the chlorophyll that gives the leaves their green colour, and as the chlorophyll disappears what remains are various yellow pigments that were hidden by the green chlorophyll, or red pigments that the tree has manufactured after the chlorophyll is gone. These serve to protect the leaf for a little while longer as the tree removes the last of the sugars and nutrients from the leaf prior to dropping it. The reabsorption process is triggered through shorter day lengths and cooling temperatures. 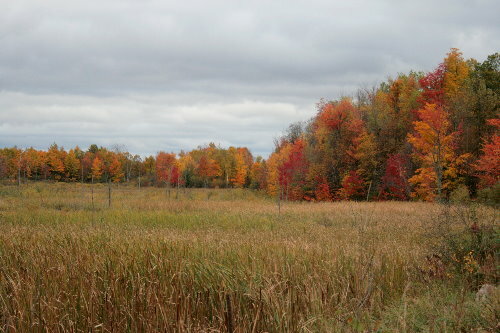 The production of additional pigments is proportional to the amount of light the leaves are receiving during this time. In last year’s post, I wrote, “Bright, cool days with chilly (but not freezing) overnight temperatures produce the best colours.” We have certainly had an abundance of those these last few weeks. Well, the cool days with chilly overnights, anyway. The last week or two we’ve had rain most days, though we had a really good stretch a little earlier in the fall where it was nothing but blue, sunny skies. Perhaps the amount of pigment production was determined at the start of the fall at the beginning of the whole process, when we were having all that sunny weather. Whatever the reason, the colours this year are fabulous. I’m not sure why a drought year results in duller colours, except perhaps that the trees start pulling out their sugars from the leaves earlier than usual and decide not to bother with the protective additional pigments. Since the ones that are manufactured are the red pigments, this would explain why there is a general absence of red or orange trees in drought years. Yellow pigments that are left behind once the chlorophyll disappears would still display as yellow, though if the tree normally supplements these with some red pigments, giving it a fire-glow tinge to the yellow, and it doesn’t do that in the drought year, the yellows would be dull. Presumably trees that normally go red by manufacturing pigments would simply go brown if they didn’t make any. Around here, I typically think of our colour peak as about the Canadian Thanksgiving weekend, which is this weekend. That’s when it seemed to peak last year, and it seems to have timed about the same this year. If you live south of the border, you can find out the particular peak for a given area by checking out this Wikipedia map (the colours stop at the border, it seems). 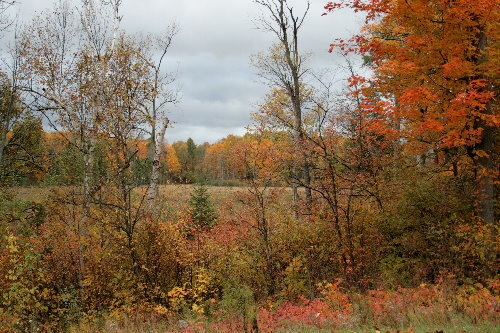 The Weather Network also maintains a Fall Colour Report, which services Canadians here. 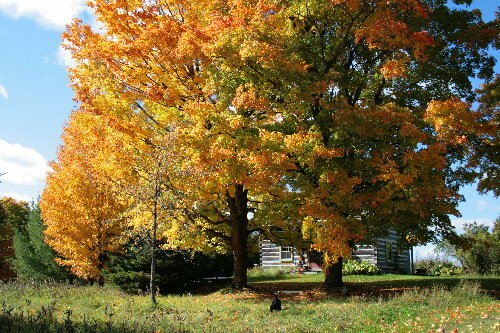 These reports are often provided by a volunteer army of “Official Leaf Peepers”. 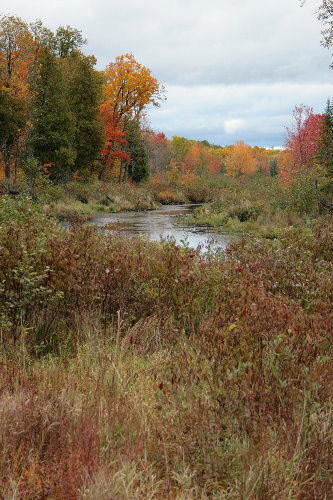 If you aren’t able to make it to New England yourself, there are quite a number of websites that have set up webcams for the purpose of allowing people to appreciate the autumn glory from afar. You can find a list of several such webcams here. 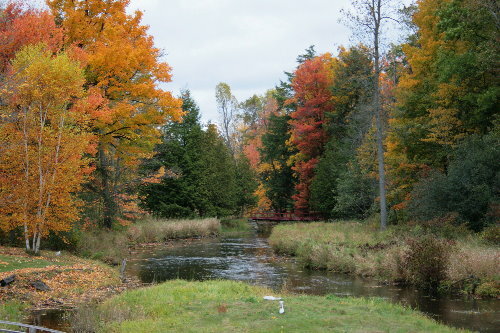 Additional “leaf peeping resources” can be found at this site. Although I’ve done a lot of traveling around the continent, and love just about everywhere I visit for its own natural beauty and unique landscapes, I don’t think I could ever leave the northeast – the gorgeous fall foliage is one of the reasons why. Beautiful! Your trees are a bit ahead of ours in color. Like the new profile photo, too. Lovely foliage photos. I really like composition in the third and eleventh and the color contrasts in the sixth. 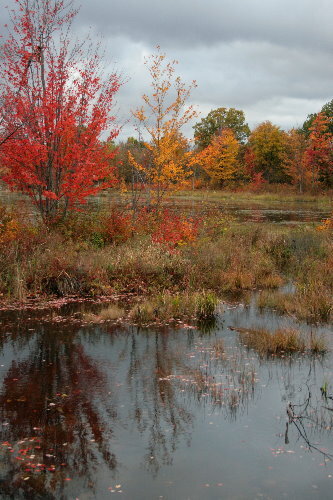 I haven’t been to New England in the fall, but we get some colorful foliage in New Jersey, usually later in the season (late October or early November). Leaf peeping. LOL! I’d never heard that term before. These are spectacular views. Breathtaking. 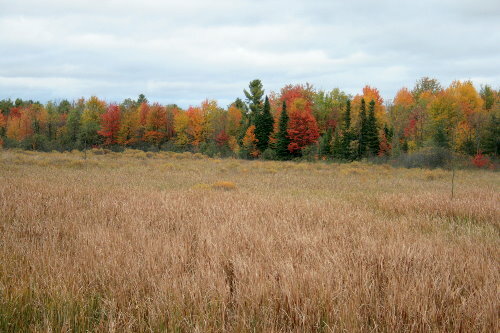 I’ve always admired the more colorful autumn transition in the north. In the south our majority trees are species that don’t do the bright show (though we have those around, albeit in smaller numbers). And I can see why the boathouse view is of such interest. For the reasons you point out, I think I’d always stop and look as well. 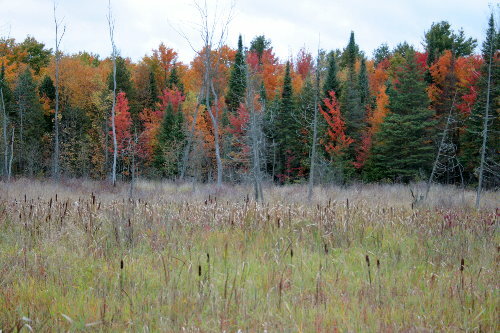 We are just about finishing up peak colors here – the reds have mostly fallen, leaving lots of orange and yellow. The Leaf Peepers have started to arrive in droves this last week. Columbus Day weekend is usually the one they target. Unfortunately, critics sway poeelps view of what art is. When such prizes as the turner prize is awarded to new art forms, the critics manipulate human thought as though it was a political contest. Art should remain in the hands of artists, and let the poetic critics tie someone else up with thier verbal knot. Your photos are beautiful. I miss the northeast. To me it is the most beautiful part of the country. wonderful pictures! when nature looks that nice it’s easier to accept that it’s getting colder. Thanks, everyone! We enjoyed our fall colours, with the display reaching its peak last weekend. Some brisk winds this week have stripped many of the trees, and it’s really beginning to look more like winter’s on its way now. You have some really beautiful pics! It’s really so lovely to capture the beauty and miracles in nature and wildlife.